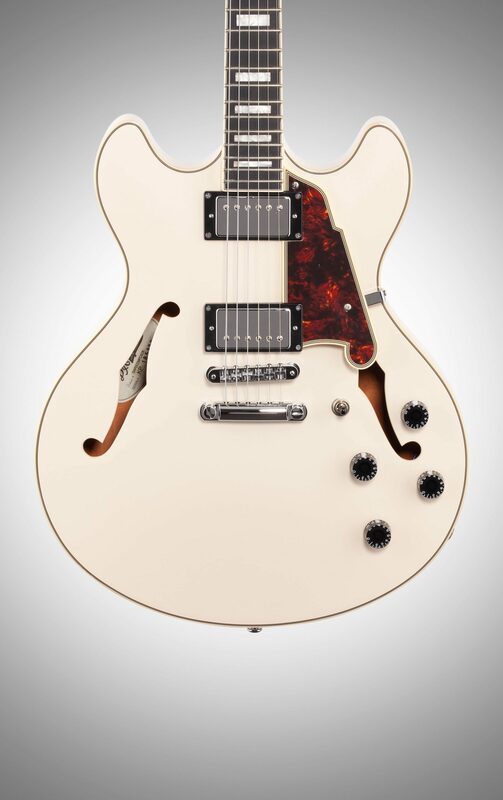 The Premier DC is a powerful double-cutaway semi-hollow with standout tone. 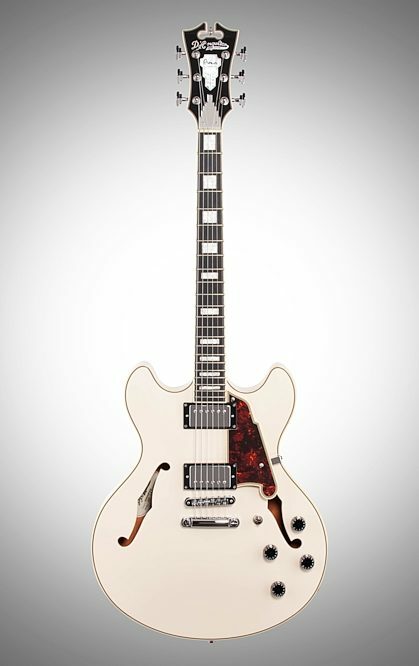 Driven by a pair of D'Angelico humbuckers, its bold mid-range and glassy high-end provide perfectly balanced output. 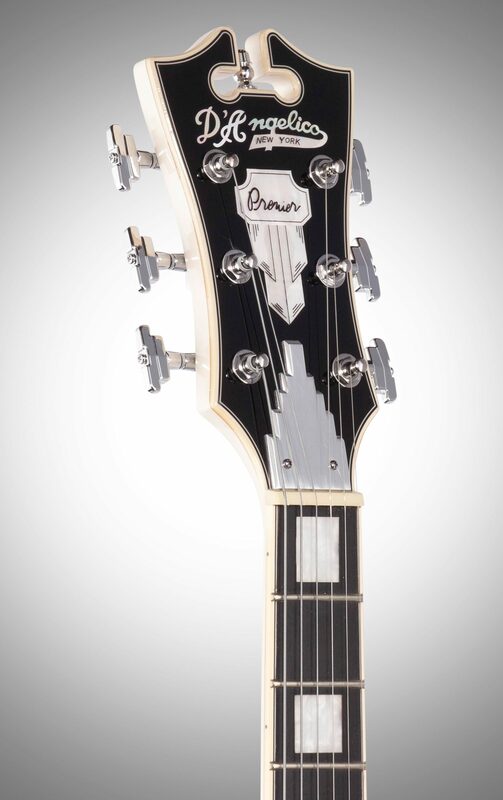 And with cream binding, a maple top, and chrome hardware, the DC's aesthetic is remarkable. Equally suited across genres, the Premier DC's tones are as diverse as they are rich. "What a guitar! DO NOT OVERLOOK!" Sound: This guitar, simply put, sounds INCREDIBLE. It is warm, resonant, musical and so versatile! I was pleasantly surprised that this particular model has the Seymour Duncan Designed pickups in it. They sound amazing! SO IMPRESSED! I play everything from Jazz to Metal and it can do everything up to modern rock and even some classic metal! Just...wow...It will hit its limit with anything past classic rock or really hard metal. That isn't what it is designed for. The guitar is easily tweakable and is responsive to knob tweaks, taking on a variety of tones, both clean and dirty. I do feel that would be even more amazing with pots that a more gradual, more audible taper to really use the pickups and the tones, but it sounds amazing as it is. The guitar is touch responsive and musical, responding to pick attack and playing style with ease! 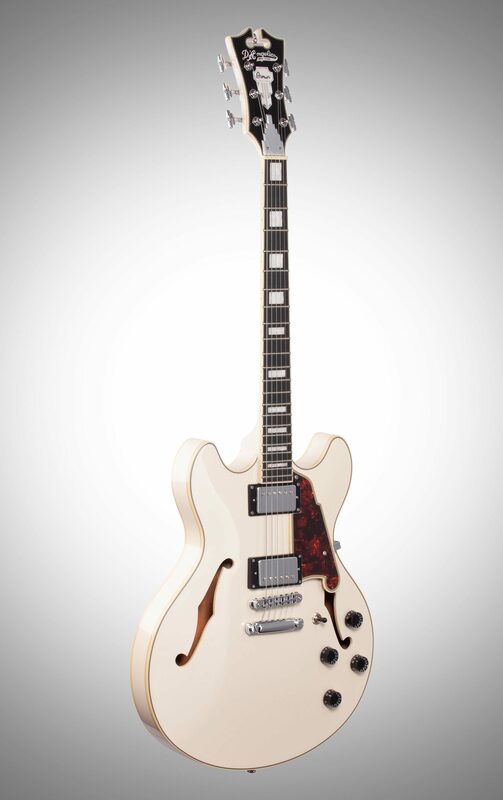 Feature: This guitar has a semi-hollow construction with a Maple body and sides, as well as a Maple Neck. The Center block inside, per D'Angelico (I emailed them! ), is Pine but couldn't tell me much, It looked like Pine or Spruce when I looked in side. The fretboard is Ovangkol, which I have never heard of, but love! Reminds me of a cross between rosewood and ebony...warm, but slightly glassy. This model has Duncan Designed pickups in it. 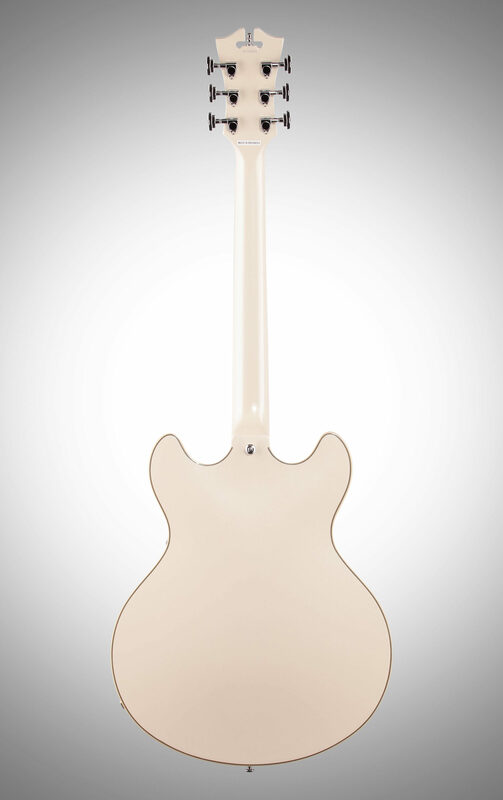 It has the DD versions of the '59 Bridge and Jazz neck. 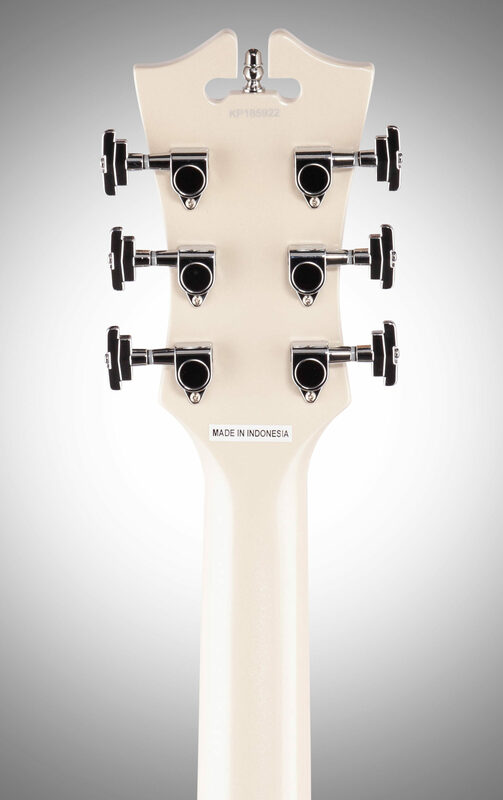 The parts, from the stair-step tailpiece to the really accurate tuners, and to the frets and build is remarkable for an guitar in this range and exceeds many US made ones! the electronics and parts are high quality, but would have loved USA SD pickups and pots with more of a gradient in their tone taper or volume taper, but they are GREAT as they are. D'Angelico made wonderful, careful selection of parts, materials and electronics in this guitar. It is a REAL winner! Ease of Use: Holy mackerel!!! what a guitar. This guitar, aside from PRS, was the first guitar in decades to really make me lose it and just jaw-drop...It is stupidly simple to coax amazing sounds and tones from this guitar just stock!! The set up, build quality, fretwork, electronics set up and overall build is just amazing and beats the competition in every way in my opinion. If you are familiar with Gibson's layout for tone/volume controls, there is NO learning curve! Just like an ES-335 in that regard for controls. The Playability is just buttery, smooth, slippery and feels like an instrument FAR, FAR ahead if its range. Even being strung with 10s it is even easier to play than my other guitars and that includes my PRS. Quality: This guitar is built to last. Honestly and truly. I don't gush over an instrument or anything unless I am just FLOORED. There were NO flaws anywhere on the build at all. the cavities are clean and tidy and electronics are beautifully set up. The tuners, tailpiece and all other pieces feel high quality and tuning is incredibly stable!!! It is reliable and has not given me any problems. It tunes easier than most and is strung with high-quality D'Addario/D'Angelico Electro-Zinc strings. The strings are WONDERFUL...so high quality and available after-market. This will last a lifetime! Value: Holy Cow, YES!!! This guitar feels, plays, sounds and is constructed FAR beyond its price point and beats everyone....hands down. I played them all in this price range and this one is just stunning...I am honestly floored. Well worth it! Manufacturer Support: I emailed them and they are quick, pleasant and so great to deal with!! They truly love what they do and have a great product. I only had product detail questions, as their website is not up to date. The new range will have Duncan pickups!! so far, this is the only model that has the Duncan Designed models, but I am eagerly awaiting the newer lines. The were very easy to reach and were readily helpful!! 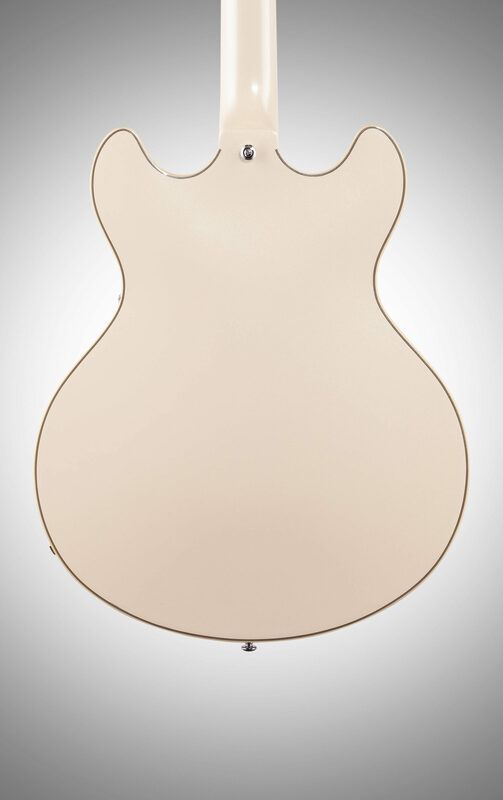 This is SO huge when dealing with a guitar company The Wow Factor: There is something magical, inspirational and just soulful about this guitar...I NEVER want to put it down...This is such a great line of guitars and my new favorite luthier. From the way it sounds, to the way it reacts to your touch and playing dynamics, to its sheer elegance...I wouldn't want another maker! Overall: I was absolutely FLOORED by this guitar and I compared it to EVERYTHING out there in the same price-point. 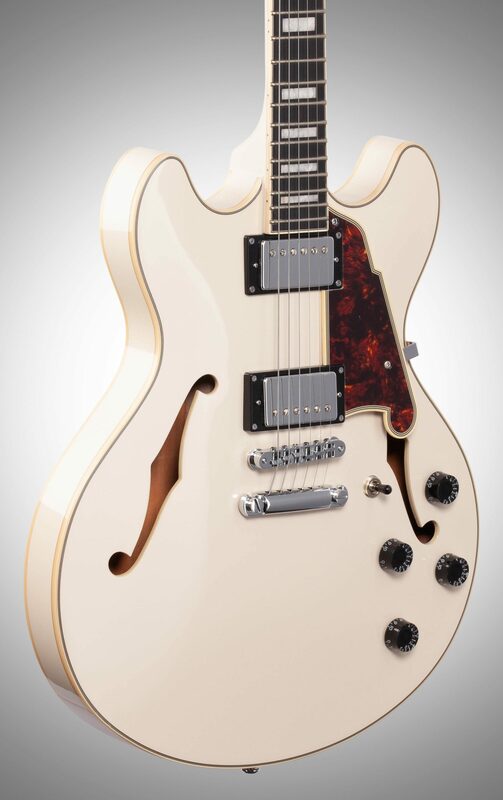 I love Semi-hollow guitars and this one exceeds in every way! I am just flabbergasted at how incredible this one sounds, plays, feels and resonates. DO NOT OVERLOOK D'Angelico! It easily competes with guitars 2-3 times as much in cost! It has become one of my main guitars.